Commodity: Gold in mineralized structures. Location: The La Rosita M.D. is in the south-western corner of the Deseado Massif, 11km east of Gobernador Gregores. Project Operator: Magna Terra Minerals has 100% control, through a leasing agreement with a private individual. Property Information: The La Rosita M.D. constitutes 2,900 Hectares of the land package. The neighbouring Mina Martha has been re-opened for exploration and production by Hunt Mining Corp.
Geology: Geological mapping and further sampling was carried out in 2009 by a previous operator and was accompanied by a geophysical IP and ground magnetic campaign. In September of 2010, 11 diamond holes were drilled, the most interesting being DDHLR04 which included an intercept of 3 meters with 0.761 ppm Au and 926 ppm Cu at a depth of 83 metres. of the Deseado Massif in that surface mineralization occurs in a complex area of shear zones which are generally hosted in carbonate sediments and sinters as well as felsic to intermediate volcanics. La Rosita occupies a basin measuring around 4 by 4 km which is formed in andesitic and dacitic volcanics and is occupied by highly deformed cherts, limestones and siltstones which are locally altered and mineralized. The formation of this basin is the result of extension and wrenching related to major regional and district scale structures which strike NNE, N-S, NNW, NW and WNW. The formation of the basin provided a site of high potential for geothermal and hydrothermal fluid flow as well as the topography for sedimentation which would ultimately cover the favourable stratigraphy and much of the evidence of hydrothermal activity. The presence of mineralization in sinters accompanied by associated soft sediment deformation, implies an environment in which sedimentation was accompanied by geothermal activity in the Jurassic period and that hydrothermal fluids, associated with structures in the underlying volcanics, had to pass through this column of unfavourable stratigraphy before brecciating and mineralizing sinters at the surface. 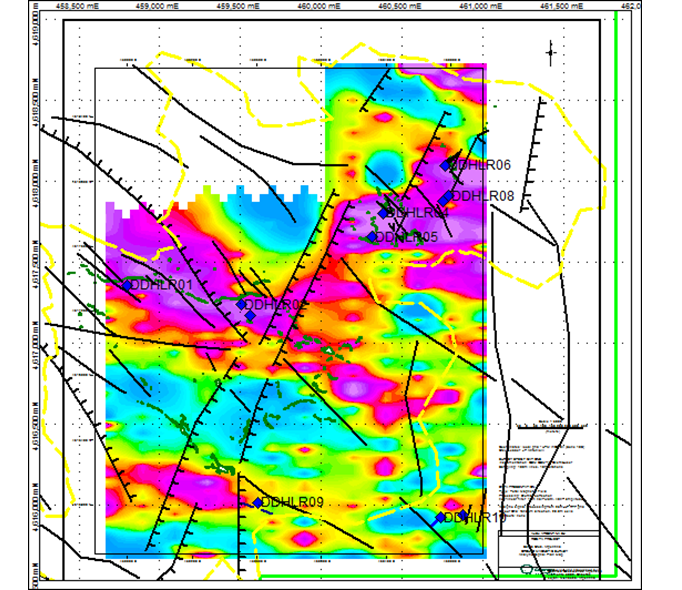 Drilling on the project, during 2010, produced multiple low grade Au intercepts. Of the 12 holes drilled, 5 hit one to several discrete intervals of at least 50 ppb Au and 2 holes intersected “significant mineralization”, here considered to be the equivalent of 2 to 3 meters (not true thickness) of at least 700 ppb. We are currently working on a structural and stratigraphic model and planning an IP Survey to supplement previous ground magnetic and gradient array surveys, in defining optimal drilling depth in zones of potential high fluid flow. Magna Terra is currently using the geophysical and geological database to re-evaluate the property in terms of known regional structure and stratigraphy. We believe that drilling to date was well located in terms of zones of potentially high fluid flow, but we deduce that the holes were collared and ended in stratigraphy which is unfavourable to vein formation.